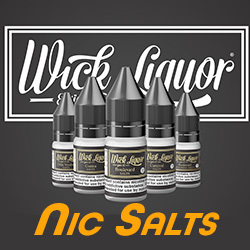 We are very proud to have the all new Wick Liquor Nicotine Salt E-Liquid range available both Wholesale & Retail. All 5 original flavours are back but with the added bonus of ultra smooth nicotine salt at an amazing 20mg strength. Needless to say these are perfect in Aspire Pod Systems and MTL tanks. The juice ratio is perfectly balanced at 50 / 50 making it suitable for all devices. The bottles are fully TPD Compliant available in 10ml and 20mg strength. So no matter if you are looking for wholesale or want the best retail deals on the Wick Liquor Nic Salt range you are in good hands with Official Aspire.